Polypropylene is a light duty, easy to clean, webbing used in various applications including dog collars and leashes, luggage, health-related products, sporting goods, tote bags and many others. Polypropylene webbing repels water, is mildew resistant and low stretch. Most polypropylene webbing can be recycled. Because it is used in extremely high volumes in many different industries we continually import large volumes of different widths in black and white and many colors. Specialty orders are accepted. 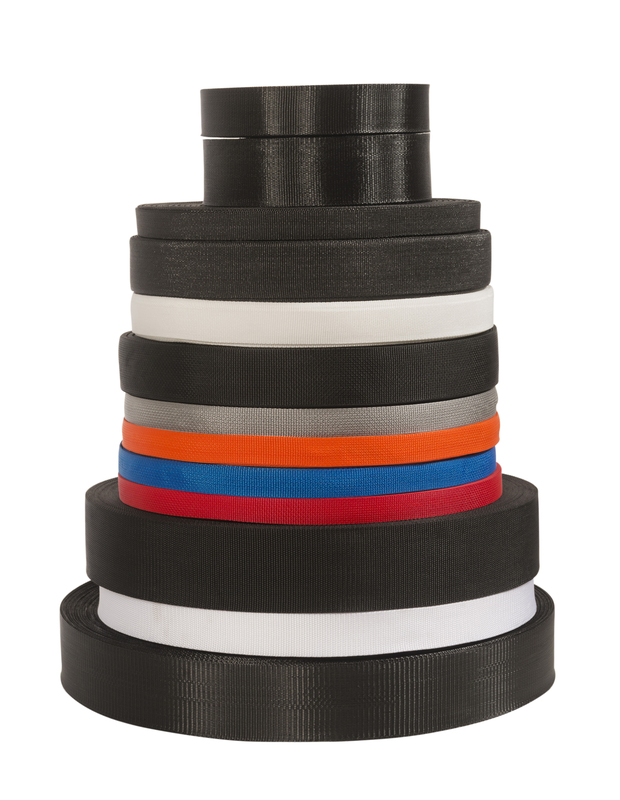 We stock standard woven polypropylene webbing in heavy, lightweight and super lightweight in various widths from ¾” up to 4” wide. This webbing is great for industrial and consumer applications requiring light duty webbing. Polypropylene webbing is available in black and white in all widths. Various colors are available upon request. We stock standard 1”, 1 ½”, 2” black and white slit-film. This material was originally designed for use in tarps and covers, but is now being used anywhere reinforcement or trim is required. Slit-film polypropylene sews more easily, accepts grommets better, is more abrasion resistant and has better UV resistance than standard polypropylene webbing. We stock 1 ¾”, 2 ½”, and 2 ¾” mono-filament in black. This material is great for agricultural applications such as shade cloths, wind screens, and greenhouses. It is also used in heating and air duct construction in place of metal brackets. Anywhere a lightweight material can be used, mono-filament is a very low cost solution. There are many applications for each type of Polypropylene webbing.